Click on the images below to increase size. INDEPENDENT candidate Maureen O'Sullivan ended more than a decade of Ahern dominance in the Dublin Central constituency after taking the by-election seat after eight counts on Saturday. The former Taoiseach's famous vote-getting powers failed to see his brother Maurice elected, with old foe Tony Gregory's understudy taking the seat. And she regained her seat on Dublin City Council on the first count, securing 2,859 votes -- well in excess of the 1,700 quota. The Gregory Group will now meet to decide who the seat should be co-opted to -- with members saying it will be a community candidate. Early tallies indicated from late morning that Ms O'Sullivan would be the next TD for Dublin Central. But the result was not made official until just after 10pm and eight counts on Saturday night. She was declared elected after reaching 13,739 votes, short of the quota of 14,207. Earlier it looked like Ivana Bacik (Lab) and Paschal Donohoe (FG) could be in the running, but transfers from Mr Ahern and Sinn Fein's Christy Burke swept her to victory. 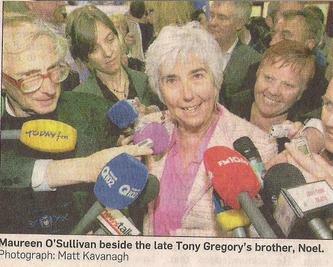 The new Dail deputy vowed to follow in Mr Gregory's footsteps and be a community-focused TD. "There's work to be done," she said. "This is for the community activists and supporters. We are a group of people who are committed passionately. This is for Tony Gregory. We did it for you." 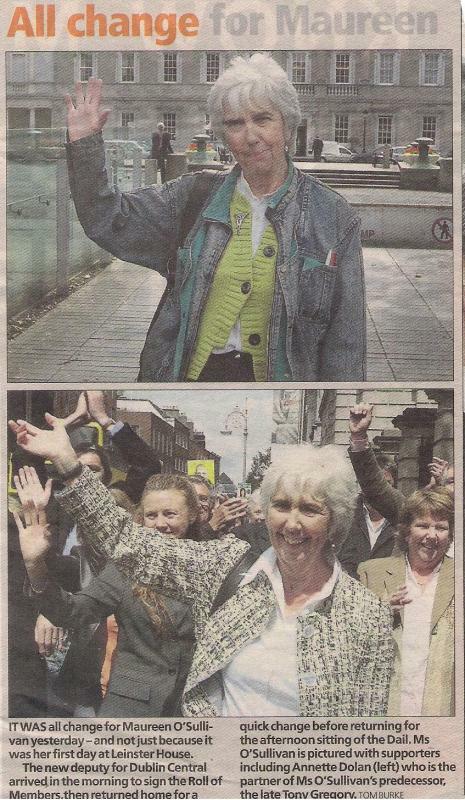 The late Mr Gregory's partner, Annette Dolan, said that much of her support came from people who appreciated his work over his political career. "The reason people came out in support of her was to pay tribute to Tony and say thanks," she said. "We wanted the work to be continued by someone with his principals. It's a voice for the underdog and the marginalised." Fine Gael's unsuccessful candidate Mr Donohoe said he would return in the next election. "I'll be wishing her the best of luck during her time as a TD in Dublin Central," he said. "She got the support of the people but we did very well. We went from 9pc of the vote to 23pc, which is a huge amount of support from the people. "We did our very best and outpolled all the other political parties. We've multiplied our vote in parts of the constituency. We'll keep hammering away to get ready for the next election." Labour's Ivana Bacik was also upbeat. "I would like to congratulate her. The Labour Party has had a remarkable achievement, strengthening our vote and increasing the number of councillors and new people elected," she said. "I'm very pleased with the vote and the strength of the left-wing vote. That is shown in the vote of both myself and Maureen O'Sullivan." INDEPENDENT TD Maureen O'Sullivan, who won a byelection on the same day as George Lee, bumped into RTE's former economics editor in Leinster House on Monday when he resigned. 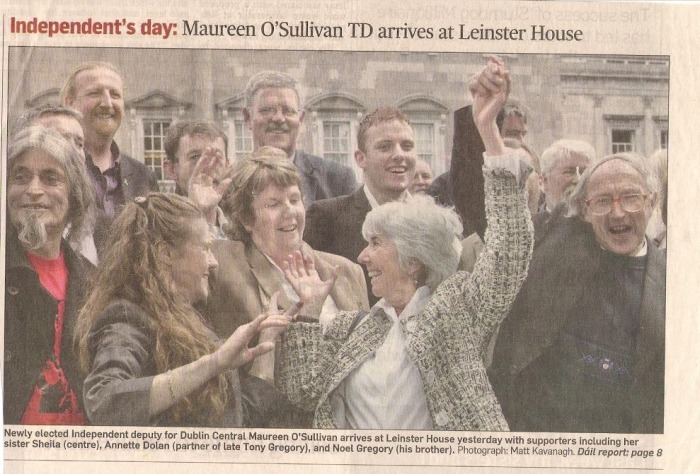 Lee was rushing out to explain his dramatic departure from Fine Gael and the Dail' to reporters, so there was only time to wish him well, but O'Sullivan could not help reflecting on that day just eight months earlier. They had both arrived as new deputies, he representing Dublin South and she Dublin Central. She was with community workers, activists and family members, and observed "the fanfare around George, all of the party". Then last Monday, "looking at him going out on his own. Now it didn't seem to bother him, he was smiling, but I just thought to myself - the contrast," she says. O'Sullivan was shocked at Lee's decision. Seeing him around, she thought he was "very much one of the boys" and had not guessed he considered himself isolated, as she admits to feeling. Does she have some dark days too? "Loads of dark days, not a few, quite a number that you just think what's it all about and where's it going and what am I doing here? "Not that I've been tempted to go but I have been saying this is a very difficult world, will I survive in it? It's very, very stressful and I never did stress in my life because I just coped, I got on with things." She also finds TV and radio appearances difficult, adding these would surely have been "child's play" to Lee, who she thinks should have considered continuing as an Independent. O'Sullivan was the late Tony Gregory's election agent and took his seat in the June 2009 byelection brought about by his death. Her campaign spend was a modest €11,516. Like many TDs, she previously worked as a teacher, but now enjoys little of the camaraderie she left behind in the staffroom. "I wouldn't say I'm close to anybody. If I go into the restaurant I'm usually sitting on my own. I haven't been in the bar at night." The slow pace of change in the Oireachtas frustrates her and Ministers' responses to parliamentary questions are also a source of annoyance. In her previous role, if her students did not answer the questions she set properly she would simply make them do it again, she laughs. O'Sullivan does acknowledge that the money is better, saying she is now very well paid. In another parallel with Lee's situation, she can always return to her previous workplace thanks to a long-standing agreement under which teaching jobs are kept open for TDs. It was not appropriate for her to retire or resign her teaching post, she insists, as she enjoyed the job and "because my school is over quota, if I resigned I wouldn't be replaced". She would like to work on legislation around byelections, believing a law should be introduced to ensure a vacancy is filled within six months when a TD resigns, retires or dies. Leaving a constituency without a TD is insulting to constituents, she says. O'Sullivan sees little difference between being an Independent and being a member of an Opposition party, in the sense that she considers both powerless in a system where power resides in Cabinet. She will never join a party, she insists. 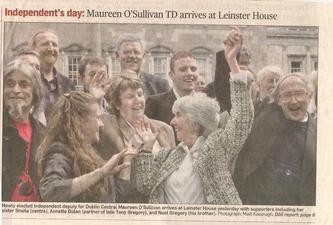 Long-serving deputies assure her it can take at least a year-and-a-half to settle into Leinster House. Among the most supportive are former Fianna Fail TD Joe Behan and fellow Independent Finian McGrath, along with Green TD Ciaran Cuffe and Sinn Fein's Caoimhghin O Caolain. What does she believe she will achieve for her constituents? "I'm not going to change the world. I don't think I'm going to change Dublin Central even, never mind the world. But I do know that I'm working hard and I just hope I can continue in Tony's legacy."